Note: Although this issue is designated “Winter 2005” it is actually the 4th issue of 2004. 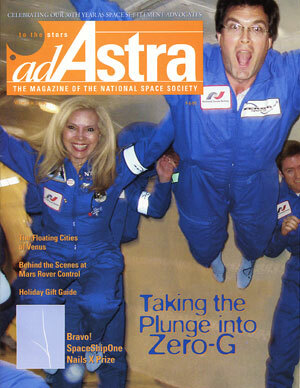 ON THE COVER: NSS members Maria Thome, Grant Anderson, and Adam London aboard the inaugural NSS Zero-G charter flight on Sept 17, 2004. Thome is the chapter president from Brasilia, Brazil; Anderson and London are space entrepreneurs. A pair of suborbital spaceflights concludes an eight-year contest and heralds a new space age. Can’t wait for SpaceShipTwo? Zero-gravity ride will leave you head-over-heals. A behind-the-scenes view from the field trip of a lifetime.